At the top of this window you can see your desktop preview with the yellow Calendar area rectangle. You can drag this rectangle to a new position and change its size by mouse. These changes will be applied to Desktop Calendar when you save or apply options. None - the background picture is absent. Picture - path to desktop picture. Pictures folder - path to any folder with the pictures. When this option is selected, you can change desktop picture using the "Current picture" drop-down box. Background color - background color of your desktop. It is visible if you don't use the background picture or this picture does not fit to screen. 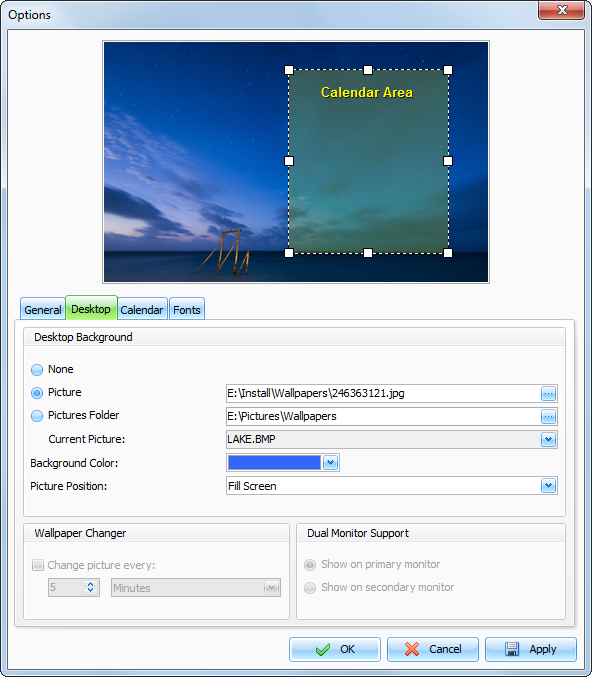 Image position - here you can choose how to display your image on the screen: Stretch, Center, Fit to Screen,Fill Screen or Tile. Change picture every [Time interval] - enables images rotation on your desktop every selected time interval. Please note that you should select Pictures folder with at least two picture files before turn on this option. This option is enabled when Interactive Calendar detected 2 monitors in system. You can choose on which monitor to show the calendar. The program supports any monitors size, position and orientation.